It must be paradise and one of those places the Locals go to. Its a bar that serves rather good food, and has thousands of Dollar Bills stuck to the building. People put more up, they don't seem to lose any to people who don't understand that it would be rude to remove them. The bills have names and locations written on them, little sayings and greetings. 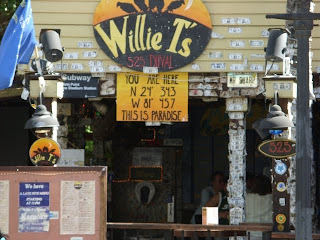 People come from all over the world to enjoy a little bit of paradise on a scruffy little island in a particularly good bar that seems to welcome all. Once you get to the island, you will find your internal clock slow down some, you'll be looking at the building next door and think that the peeling paint is "local color" instead of sloppy, and that there's always tomorrow. All in all a rather nice place for a vacation.